Rendering of Rheingold Development as seen from Bushwick Avenue and Forrest Street, Brooklyn. Image Courtesy of Forrest Lots, LLC. Controversial Bushwick development project questioned on affordable housing goals in public hearings. On December 10, 2013, the full City Council voted 48-1 to rezone six blocks in Bushwick, Brooklyn, in order to allow the development of ten mixed-use developments. The rezoning area is bounded by Bushwick Avenue, Flushing Avenue, Melrose Street, Stanwix Street, and Forrest Street. Council’s Committee on Land Use voted 18-1 and Land Use Subcommittee on Zoning and Franchises unanimously voted 10-0 to approve the project. Council Member Charles Barron voted in the negative at the Stated Meeting and Land Use Committee meeting, citing concerns about housing affordability. 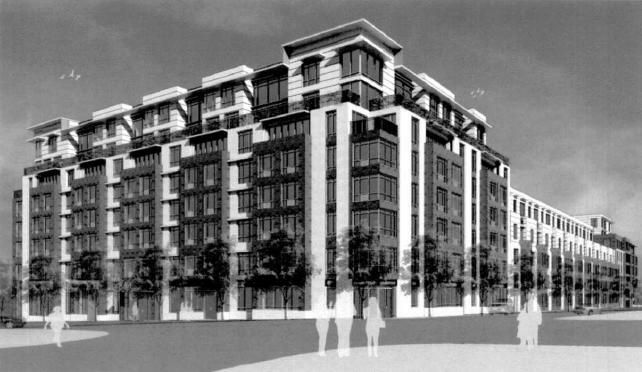 The applicants, Forrest Lots, LLC, a division of Read Property Group, LLC, proposed mixed-use residential and commercial developments that would range from six to eight stories in height and would include 977 units of housing with 24 percent allocated to affordable housing, 54,132 sq. ft. of ground floor retail space, 504 accessory off-street parking spaces, and a publicly accessible open space. The affordable housing would be open to residents earning 60 percent or less of the Area Median Income (AMI). Of the 242 units of affordable housing, 47 would be allotted for senior housing. The publicly accessible, landscaped open space would create a pedestrian connection between the intersections of Renaissance Court and Stanwix Street to the west and the intersection of Evergreen and George Street to the east. The M1-1 and M3-1 under the Forrest Lot’s control are currently vacant and used for truck blocking, or occupied by warehouse structures to be demolished. Forrest Lots sought to amend the zoning map for the M1-1 zoned area to R6A, R6A/C2-4, R74 and R7A/C2-4, and the M3-1 zoned area to M1-2. The rezoning areas not under the applicant’s control are zoned M1-1 and are characterized by mixed-use residential buildings with ground floor retail, warehouses, auto-oriented uses, and manufacturing uses. Rheingold Gardens and Renaissance Estates, located immediately to the west of the rezoning area, are comprised of 460 residential units in row-houses and mixed-use rental apartment buildings with ground-floor retail. Many of the residences are affordable homeownership units created by the 2001 zoning map amendment from M3-1 to R7-2 and the West-Bushwick Urban Renewal Plan. Local Council Member Diana Reyna questioned Forrest Lots questions about their affordable housing goals and availability and use of subsidies to incentivize affordable and senior housing. She also raised questions concerning fresh food store area goals to address high rates of childhood obesity in the area, job creation and economic opportunity for small businesses, availability of community spaces and open spaces, traffic and parking assessments and mitigation; and increased enrollment in local elementary schools. Some residents of the neighborhood expressed support of development, explaining that the project would produce opportunities for economic growth, jobs and new playgrounds. Other local residents and representatives opposed the application, arguing that the proposed development would be out of character with the existing neighborhood, would create traffic and shortage of parking spaces, and that local schools and open spaces were insufficient to accommodate additional residents. The opponents also criticized the affordability levels provided by the proposed project as insufficient. David Ocasio, treasurer of the Rheingold Homeowners Association and a homeowner in Renaissance Court, a street directly adjacent to the proposed development, said that he and his neighbors were against “overdevelopment” and the “upheaval” of their neighborhood. He requested that the building heights to be lowered and that Forrest Lots conduct traffic mitigation and public transportation studies to address the concerns of the community. Opposing speakers also criticized the application review process, stating that they were insufficiently informed about the ongoing public review process and that the Community Board’s vote was closed to the public and not duly noticed. Brooklyn Community Board 4 held a public hearing on this application on June 19, 2013 and subsequently voted 29-3 to approve application in a private meeting. The Community Board recommended approval of the application with the condition that the number of affordable housing units be increased to more than 24 percent of units currently proposed. The City Planning Commission report ruled that the Community Board vote was non-complying with the public notice requirements of the Uniform Land Use Review Procedure Rules. Brooklyn Borough President Marty Markowitz issued a recommendation for the project on September 4, 2013 with conditions regarding affordable housing, open space mitigation, supermarket and parking. The City Planning Commission held a public hearing on September 11, 2013, and unanimously voted to approve the project on October 23, 2013. Council Member Reyna in a December 10, 2013 press release announced that Forrest Lots had raised the affordable housing requirement to 30 percent of the total market-rate units being built. They also agreed to transfer seven lots to a local non-profit for the development of affordable housing; guarantee local hiring for both construction and building maintenance, commit 20 percent of construction contracts to M/WBE and LBE firms, and provide preferences for community parking and mitigate truck traffic on residential streets. Forrest Lots also promised to allocate over $1.2 million towards workforce development training for local construction jobs, computer lab upgrades and urban gardening initiatives in neighboring elementary schools, improvements to Green Central Knoll Park, non-profit tenant legal assistance in Bushwick, supportive services to affordable units, and programming in a community facility to be located on the property. City Council: Bushwick-Rheingold Rezoning (N110179 ZRK – zoning text amendment); (C 070250 MMK – City map amendment)(December 10, 2013). By: Jennifer Baek (Jennifer is a City Law Fellow and a New York Law School Graduate, Class of 2013).